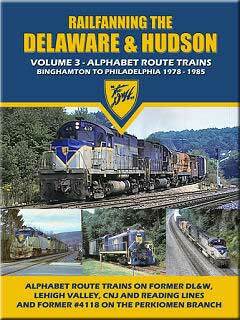 Volume 3 of Railfanning the Delaware & Hudson covers the Alphabet route trains on the former DLW line from Binghamton, NY to Taylor, PA, former Lehigh Valley and CNJ lines from Dupont to Allentown and ex-Reading lines from Allentown to Philadelphia. After the fall of the Anthracite roads in 1976, the D&H continued the �Alphabet route� trains via trackage rights on what had then become Conrail owned trackage. The D&H accessed Allentown from a connection at Dupont, PA onto former Lehigh Valley and CNJ lines, which was named by Conrail as the �Lehigh Line�. Ex-Reading lines from Allentown to Philadelphia allowed the D&H to reach the city of brotherly love and connection with the B&O. This routing would remain in place until May of 1999, when Conrail was split between Norfolk Southern and CSX. In keeping with the D&H on former Reading trackage theme, we'll finish with Anthracite Railroad's RS-3 #4118, former D&H engine, on the Reading Perkiomen Branch. very good film and color. not to much narration and that's find with me. good sound action.